I’m a Lancashire lad, so for me the pie is almost an auspicious symbol. Much as I appreciate a range of llings, I personally believe that it’d be hard to nd a pie to compete with a simple minced beef with its silky gravy and short, crisp pastry. I add the horseradish sauce here because I like the heat and slight sourness, but if you prefer to leave it out, feel free to do so. And when it comes to a sauce on the side – I know this is a controversial subject – it has to be a tangy brown sauce for me. For the pastry, rub the butter into the our with 1 teaspoon salt until it resembles breadcrumbs. Make a well in the centre. Beat together the egg, horseradish sauce and water and add to the dry ingredients. Use a dough scraper or knife to cut the wet ingredients into the dry. If it doesn’t quite come together, add a little more water. Once the dough is fairly sti but smooth, gently work for a few seconds until smooth. Flatten into a disc, wrap in cling lm and chill for an hour. about 20 minutes. Increase the heat to high and add the our to the onions, stirring to mix well. Add the stock, bring to the boil, then reduce to a gentle simmer and cook until the liquid has reduced by half. Remove from the heat, add the Worcestershire and horseradish sauces and season to taste – remember to make it ever so slightly salty so that the beef doesn’t dilute it too much. Stir in the beef to mix well, then remove from the heat and allow it to cool. Roll out half of the pastry on a oured worktop until reasonably thin – don’t be too eager, but don’t make it too thick. Line a 23cm pie dish with the rolled-out pastry, allowing the excess to hang over the sides. Pile the lling into the pie dish, then roll out the remaining pastry and use it to cover the lling. Remove the surplus pastry and crimp the edges. 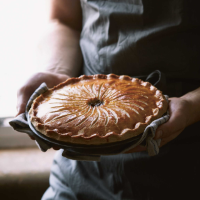 Glaze the pie with the beaten egg, then cut a cross into the top to allow steam to escape. Bake the pie for 35–40 minutes, or until the pastry is golden brown and the lling is very hot (I push a knife into the centre of the pie, and if the blade feels too hot to touch, the pie is ready).